There’s a traveler in his journey that finds a fork, it’s confusing him. But he knows that he can’t choose both of them. There’s one of them that he has to choose, the right one. His mind is full of doubt, and also he needs to decide which way to go to continue his journey. the traveler picks the road “less traveled by.” It means that the road which is less of risk. The implicit meaning that we can get from the poem that in life sometimes we find difficulties to decide which one is better to make us fine to continue our lives. Sometimes mental debate gets involved in our thoughts of making right decision. 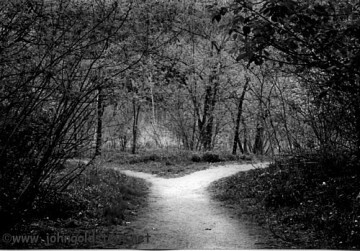 However, we have to choose one of them, but both of them are difficult choices, but still, we have to choose one of them. It needs long time to make up our minds until we meet the right one, at least the choice that suitable for our hearts. The road here means life, road of life that sometimes we meet barrier stops our steps. After we make up our mind then we choose one of the choices that perhaps the best one.